Dearborn-based Ford Motor Co. today shared the first images of the Territory, a mid-size SUV that will compete in the Chinese market. Jiangling Motors Corp. in China helped Ford develop the Territory. The collaboration between the two companies helped meld Chinese customers’ tastes with Ford’s global experience in vehicle design, engineering, testing, and manufacturing. The Territory will be manufactured at JMC’s Xiao Lan plant, which meets Ford’s global manufacturing standards. 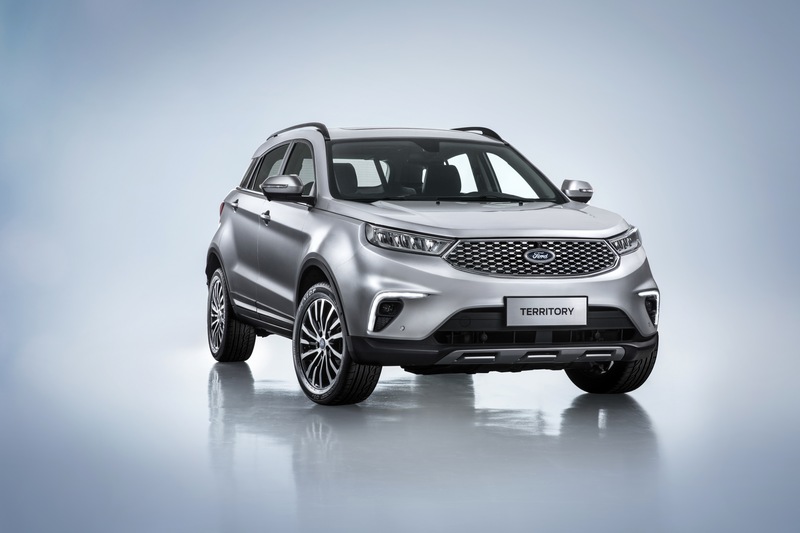 “The new Ford Territory shows what can be achieved when two global companies collaborate closely, bringing their respective strengths to meet the needs of a broad spectrum of Chinese consumers,” says Qiu Tiangao, chairman of JMC. Customers can choose between a fuel-efficient gasoline engine, a 48V mild hybrid with Miller-Cycle technology, and a plug-in hybrid powertrain. The vehicle is expected to go on sale in early 2019. It will also offer Ford’s infotainment system with intuitive Mandarin voice-command function, Co-Pilot360 suite of driver assistance technologies, and incorporate features such as adaptive cruise control and FordPass Connect with embedded modem. In China, the greatest growth in demand for automobiles will not come from traditional Tier 1 cities such as Beijing and Shanghai, which have implemented license plate restrictions to manage traffic congestion, but from smaller but fast-growing cities in the interior of the country. The number of registered passenger vehicles in Chinese cities with no license plate restrictions is expected to increase to about 23.7 million in 2020, up from 10.8 million in 2010, according to IHS Markit’s latest China Provincial Forecast. Vehicle registrations in restricted cities are expected to fall to 1.6 million in 2019, from a peak of 2.2 million in 2010. The midsize SUV segment in China saw an annual growth rate of 38 percent in China between 2012 and 2016, according to McKinsey’s China auto consumer survey 2017. The Territory is part of Ford’s plan to launch more than 50 new vehicles in the country by 2025.